The Public Transport state election of 2018 rolls on, with another big-ticket election promise unveiling by The Greens to create a large-scale rapid bus network in Melbourne's East. According to the policy information on one of the Greens' websites, the rapid bus network is focused on connecting multiple eastern suburbs destinations with priority given to a bus fleet that is powered by electricity. Importantly, this Rapid Bus Network can be rolled out within a year, and will reduce congestion immediately. It won’t take 10 years to build like the North East Link toll road, or 28 years to build like the Suburban Rail Loop. The Rapid Bus Network can be integrated and adapted into future transport network changes. Dedicated bus stops would be built, similar to a platformed tram stop, and include myki readers to enable faster loading and unloading of the buses. Free wi-fi and power outlets would be provided on the buses as well. 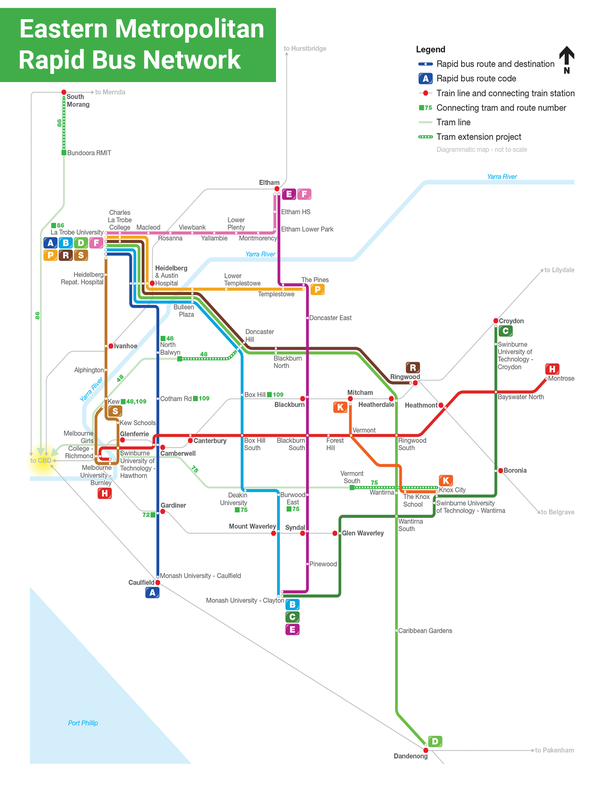 The focus of the new services is anchored in La Trobe University and providing connectivity to the east, south-east and south of the Bundoora campus, and the map depicts how the new bus routes will link with another of the Greens' election policies: tram route extensions. Much of the physical infrastructure required to enable the faster services involves adding dedicated bus lanes, 'turning slip lanes' and bus priority at traffic lights, according to the information on the Greens' website. Large patronage generators such as Universities, railway stations, retail and other employment centres are a focus for the network and the policy states that services would run every 10 minutes, all day, every day across the 11 proposed routes. Unless one of the major parties decides to ride the coattails of a brand new freeway into the state election, at this stage of the game, November 2018 is looking like a public transport election. The three main parties which are in contest for seats in metropolitan Melbourne have all focused on different areas of public transport - the Greens thus far are focusing on extending or upgrading road-based public transport (trams and buses), the government/ALP are focused on big-ticket rail projects (Airport Link, Suburban Rail Loop) and the Liberal Party in conjunction with their National party coalition partners have placed an emphasis on regional rail. The rapid bus proposal from the Greens ties in nicely with the Suburban Rail Loop put forward by the ALP - at least the eastern portion of the rail loop - and would no doubt butter the middle and outer ring suburbs up for the eventual transition to the even faster Suburban Rail Loop. The Liberal's regional fast rail would be greatly enhanced with the ALP's Suburban Rail Loop. Ditto, the Greens' rapid bus network because it would put multiple education and employment centres within one change of the Latrobe Valley railway line. Whoever is able to form a government after November 24th is anyone's guess, however, wouldn't it be nice to have all of the above in a funded, multi-decade plan?